The driving range can be an excellent place to hone your game. It can be hard for some golfers to turn a trip to the driving range into something more than just an opportunity to smack a bucket full of balls into an open field. Turning your driving range time into quality practice time takes dedication and focus, but in the end, it can help you improve your game and lower your score on the course. Instead of bashing a full bucket of balls with the same club, try making a mental game out of your next trip to the driving range. Pick a standard hole distance, such as 425 yards, for example. Pull out your usual club off the tee, such as a driver, and give it your best shot. Estimate the distance your shot went, and subtract that from your original distance. If, for example, you hit your drive 275 yards, you have 150 yards to go. Pull out the corresponding club for that distance and pick a spot out on the range that matches that distance. Take a shot and see how close you can get. If you’re 15 yards or more away, pull out a wedge and practice a pitch or chip as if you were going to hit it on the green. Simulating play out on the course can help your prepare for your next round. When you hit a quality shot on the driving range, take a second and close your eyes. Take a few deep breaths and envision the shot you just hit in your mind, along with the pure swing you just used. According to sports psychologist Nick Rosa, this will help establish a mental connection between to your peak swing performance. When you’re out on the course, and you close your eyes and take the same deep breaths, your mind will naturally help your body perform the same solid swing. 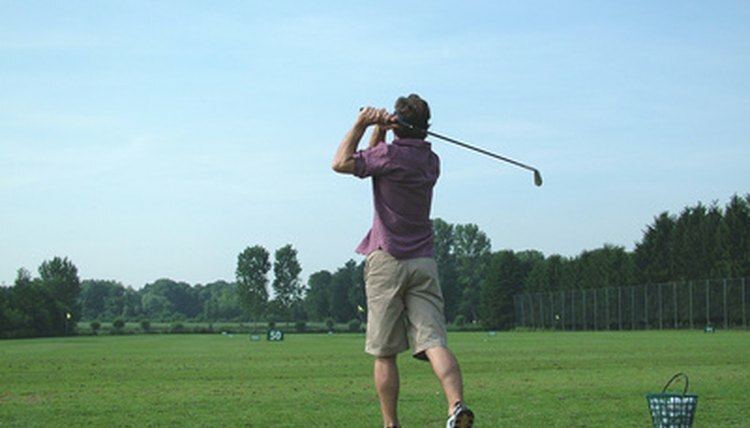 Most golfers tend to hit the driving range and try to improve every aspect of their swing with every club. That’s an ineffective approach, says professional golf instructor Donald Crawley. Instead, pick one aspect of your game that’s been troubling you. If you have difficulty rotating your hips through your swing, spend your entire practice session focusing on that and nothing else until you have it perfected rather than moving from one problem area to the next. Instead of taking all of your clubs to the driving range, pick one or two that you struggle with to resist the temptation to pull out your best club and hit balls to make yourself feel better. Golf Tips Magazine: Wake Up Your Game!